Please refer to our stock # 3010 when inquiring. From the Age of the Patriarchs. 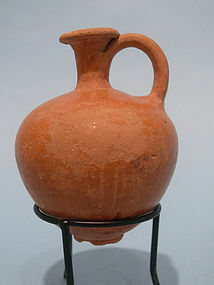 Middle Bronze Age II Canaanite glazed juglet, ca. 1735 BCE, found in a cave in Hebron. Intact and in very good condition with a very small hole at bottom of vessel. 3 3/4" high. Ex: Archaeological Center, Old Jaffa. Around 1950 BCE, urban life revived in Canaan. For the first time, palaces were built in the largest settlements. These palace-towns controlled nearby villages and vied with one another for power. From Syria to the Egyptian Delta, rulers competed for prestige though warfare, trade, building projects and fine crafts. In Egypt, near the middle of the 17th century BCE, a group of Canaanites, known as Hyksos came into power and ruled the northern part of the country as self-styled Pharaohs for over 100 years. Eventually, an Egyptian royal family centered in Thebes in southern Egypt gathered enough power to challenge the Hyksos. In 1539, the Pharaoh Ahmose drove the Hyksos out of Egypt and began to build an empire. From Syria to Egypt, people in the Middle Bronze Age buried their dead with elaborate rituals which shared many common traits. Caves were used for multiple burials in which several generations of family members were placed in the same tomb. A rich collection of goods was found with burials, including pottery vessels, wooden containers, weapons, tools and jewelry. Elite males of all ages occasionally were given "Warrior Burials." The dead were dressed in a metal belt, with an axe at their head, a dagger at their waist, and a sheep, goat or donkey sacrificed near the entrance to the tomb. Elite women also were buried in garments fastened with toggle pins and jewelry, such as scarabs. Another form of burial was that of infants in pottery jars under the floors of rooms and courtyards. The body of the infant was placed inside the jar with gifts such as ointment juglets and jewelry. This practice did not continue into later periods and may indicate a high rate of infant mortality. An infant burial of this type was excavated at Sarepta. The weapons of the warriors were now made of bronze. Bronze is an alloy of copper with 5-10% tin, which was likely imported from Afghanistan. New types of weapons made in the Middle Bronze Age were the duckbill axe, the narrow, chisel-shaped axe, and a leaf-shaped dagger with a wooden handle and a stone pommel. The Middle Bronze Age was a period of great wealth and strong self-government of individual city-states. The aristocratic local rulers embellished their cities with large scale public buildings, temples and palaces. Orthogonal town planning was in effect, with paved streets at right angles. Cities were surrounded by huge fortifications, with ramparts built to defend against the battering rams of enemies. The chariot was used in battle at this time. Despite their great defenses, many of the cities in Canaan were destroyed in the turmoil following the Egyptian expulsion of the Hyksos in the mid-16th century BCE. This event led to the collapse of the Middle Bronze Age social system in Canaan.